Chris Van Allsburg adds another visually stunning creation to his repertoire with Queen of the Falls. The Caldecott Medal and Honor recipient admirably translates his facility with fiction to this nonfiction book, and his talent for beautiful, detailed, and evocative illustration is again evident. He conveys depth, beauty, and reality using sepia-toned illustrations rendered to look like old photographs. 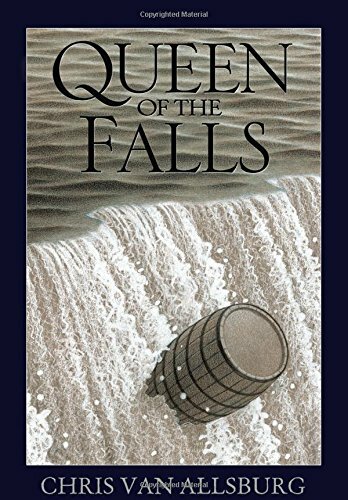 Mr. Van Allsburg’s prose effectively generates dramatic tension, climax, and narrative flow in recounting the tale of Annie Edson Taylor, the first woman to attempt a trip down the Niagara Falls. The prose and illustration absorb the reader throughout; we are in the barrel with Annie, perched for a moment at the precipice of the Falls. As the drama of the story unfolds, adult readers are likely to experience a lingering, underlying apprehension. Which of two troubling likely outcomes will we see: the tragic one of an unsuccessful effort, or the morally unsettling one about the rewards that accompany the pursuit of fame and sudden wealth? It seems that Mr. Van Allsburg is quite aware of this conflict; he has deliberately inserted this moral quandary. He is successful in achieving a resolution and he also manages to deliver a commentary on the appeal of fame and a rather capricious public. Although they will cheer for her survival, children might feel the same disquiet about Annie’s goal and motivations and about the possible outcome. Also, sadness and misfortune underlie much of the story, and the climax is rather frightening. For this reason, the story might be a difficult one for younger readers and will require the guidance of adults. For older readers, though, the tale offers an exciting story and an atypical presentation of useful lessons and observations of society.